Normally, I only publish blog posts on Monday, but I’m so excited about this one that it couldn’t wait and I decided to hit the publish button early. You see, just a few days ago, François Chollet pushed three Keras models (VGG16, VGG19, and ResNet50) online — these networks are pre-trained on the ImageNet dataset, meaning that they can recognize 1,000 common object classes out-of-the-box. Download the weights files for the pre-trained network(s) (which we’ll be done automatically for you when you import and instantiate the respective network architecture). Apply the pre-trained ImageNet networks to your own images. So, why is this so exciting? I mean, we’ve had the weights to popular pre-trained ImageNet classification networks for awhile, right? The problem is that these weight files are in Caffe format — and while the Caffe library may be the current standard for which many researchers use to construct new network architectures, train them, and evaluate them, Caffe also isn’t the most Python-friendly library in the world, at least in terms of constructing the network architecture itself. Note: You can do some pretty cool stuff with the Caffe-Python bindings, but I’m mainly focusing on how Caffe architectures and the training process itself is defined via .prototxt configuration files rather than code that logic can be inserted into. There is also the fact that there isn’t an easy or streamlined method to convert Caffe weights to a Keras-compatible model. That’s all starting to change now — we can now easily apply VGG16, VGG19, and ResNet50 using Keras and Python to our own applications without having to worry about the Caffe => Keras weight conversion process. It’s now dead simple to apply ImageNet-level pre-trained networks using Python and Keras. To find out how, keep reading. In the remainder of this tutorial, I’ll explain what the ImageNet dataset is, and then provide Python and Keras code to classify images into 1,000 different categories using state-of-the-art network architectures. Within computer vision and deep learning communities, you might run into a bit of contextual confusion surrounding what ImageNet is and what it isn’t. You see, ImageNet is actually a project aimed at labeling and categorizing images into almost 22,000 categories based on a defined set of words and phrases. At the time of this writing, there are over 14 million images in the ImageNet project. So, how is ImageNet organized? To order such a massive amount of data, ImageNet actually follows the WordNet hierarchy. Each meaningful word/phrase inside WordNet is called a “synonym set” or “synset” for short. Within the ImageNet project, images are organized according to these synsets, with the goal being to have 1,000+ images per synset. In the context of computer vision and deep learning, whenever you hear people talking about ImageNet, they are very likely referring to the ImageNet Large Scale Recognition Challenge, or simply ILSVRC for short. The goal of the image classification track in this challenge is to train a model that can classify an image into 1,000 separate categories using over 100,000 test images — the training dataset itself consists of approximately 1.2 million images. Be sure to keep the context of ImageNet in mind when you’re reading the remainder of this blog post or other tutorials and papers related to ImageNet. While in the context of image classification, object detection, and scene understanding, we often refer to ImageNet as the classification challenge and the dataset associated with the challenge, remember that there is also a more broad project called ImageNet where these images are collected, annotated, and organized. To configure your system to use the state-of-the-art VGG16, VGG19, and ResNet50 networks, make sure you follow my latest tutorial on installing Keras on Ubuntu or on macOS. GPU Ubuntu users should see this tutorial. To run the networks pre-trained on the ImageNet dataset with Python, you’ll need to make sure you have the latest version of Keras installed. At the time of this writing, the latest version of Keras is 1.0.6 , the minimum requirement for utilizing the pre-trained models. Figure 1: Listing the set of Python packages installed in your environment. If you are using an earlier version of Keras prior to 2.0.0 , uninstall it, and then use my previous tutorial to install the latest version. We are now ready to write some Python code to classify image contents utilizing Convolutional Neural Networks (CNNs) pre-trained on the ImageNet dataset. We start on Lines 2-8 by importing our required Python packages. 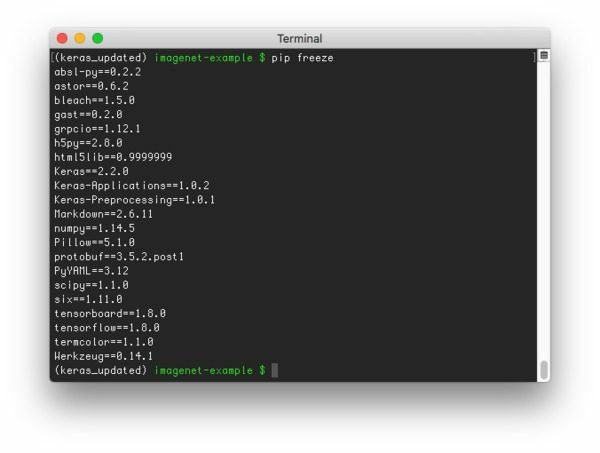 Line 2 imports the image pre-processing module directly from the Keras library. Lines 11-14 parse our command line arguments. We only need a single switch here, --image , which is the path to our input image. We then load our image in OpenCV format on Line 18. This step isn’t strictly required since Keras provides helper functions to load images (which I’ll demonstrate in the next code block), but there are differences in how both these functions work, so if you intend on applying any type of OpenCV functions to your images, I suggest loading your image via cv2.imread and then again via the Keras helpers. Once you get a bit more experience manipulating NumPy arrays and swapping channels, you can avoid the extra I/O overhead, but for the time being, let’s keep things simple. Line 25 applies the .load_img Keras helper function to load our image from disk. We supply a target_size of 224 x 224 pixels, the required spatial input image dimensions for the VGG16, VGG19, and ResNet50 network architectures. After calling .load_img , our image is actually in PIL/Pillow format, so we need to apply the .img_to_array function to convert the image to a NumPy format. If at this stage we inspect the .shape of our image , you’ll notice the shape of the NumPy array is (3, 224, 224) — each image is 224 pixels wide, 224 pixels tall, and has 3 channels (one for each of the Red, Green, and Blue channels, respectively). However, before we can pass our image through our CNN for classification, we need to expand the dimensions to be (1, 3, 224, 224). When classifying images using Deep Learning and Convolutional Neural Networks, we often send images through the network in “batches” for efficiency. Thus, it’s actually quite rare to pass only one image at a time through the network — unless of course, you only have one image to classify (like we do). We then preprocess the image on Line 34 by subtracting the mean RGB pixel intensity computed from the ImageNet dataset. On Line 38 we initialize our VGG16 class. We could also substitute in VGG19 or ResNet50 here, but for the sake of this tutorial, we’ll use VGG16 . Supplying weights="imagenet" indicates that we want to use the pre-trained ImageNet weights for the respective model. Once the network has been loaded and initialized, we can predict class labels by making a call to the .predict method of the model . These predictions are actually a NumPy array with 1,000 entries — the predicted probabilities associated with each class in the ImageNet dataset. Calling decode_predictions on these predictions gives us the ImageNet Unique ID of the label, along with a human-readable text version of the label. Finally, Lines 47-57 print the predicted label to our terminal and display the output image to our screen. To apply the Keras models pre-trained on the ImageNet dataset to your own images, make sure you use the “Downloads” form at the bottom of this blog post to download the source code and example images. This will ensure your code is properly formatted (without errors) and your directory structure is correct. But before we can apply our pre-trained Keras models to our own images, let’s first discuss how the model weights are (automatically) downloaded. 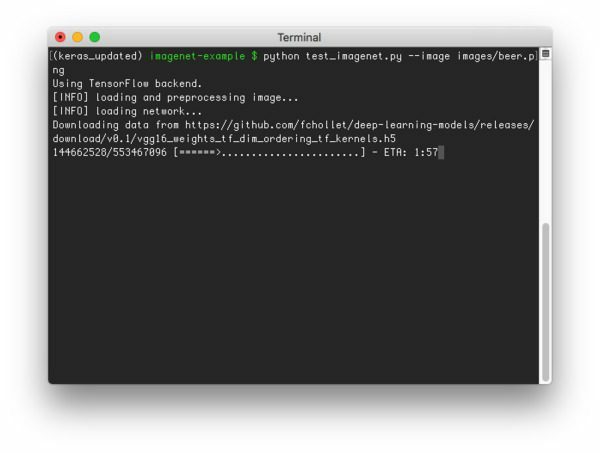 The first time you execute the test_imagenet.py script, Keras will automatically download and cache the architecture weights to your disk in the ~/.keras/models directory. Subsequent runs of test_imagenet.py will be substantially faster (since the network weights will already be downloaded) — but that first run will be quite slow (comparatively), due to the download process. We are now ready to classify images using the pre-trained Keras models! To test out the models, I downloaded a couple images from Wikipedia (“brown bear” and “space shuttle”) — the rest are from my personal library. Figure 2: Downloading the pre-trained ImageNet weights for VGG16. 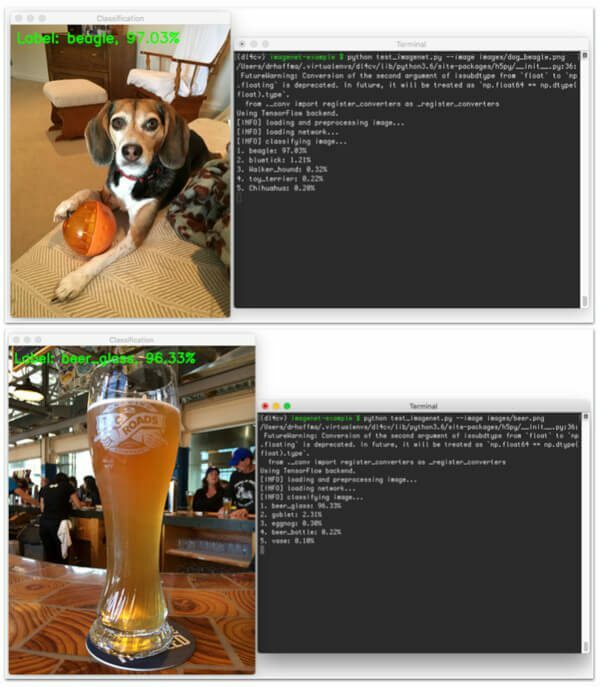 Figure 3: Utilizing the VGG16 network trained on ImageNet to recognize a beagle in an image. 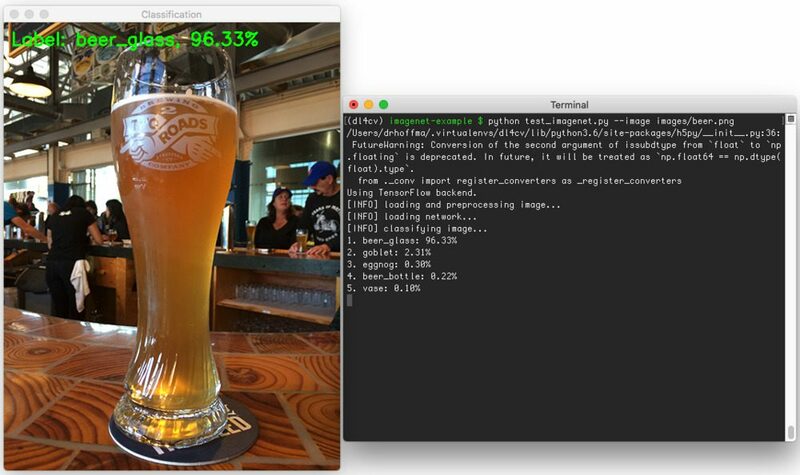 Figure 4: Recognizing a beer glass using a Convolutional Neural Network trained on ImageNet. 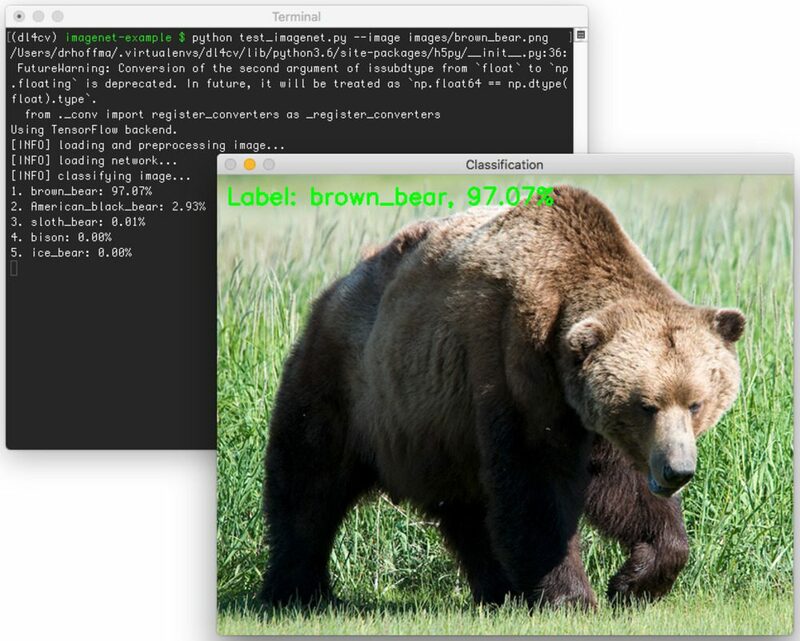 Figure 5: Utilizing VGG16, Keras, and Python to recognize the brown bear in an image. Figure 6: Utilizing Python, Keras, and a Convolutional Neural Network trained on ImageNet to recognize image contents. 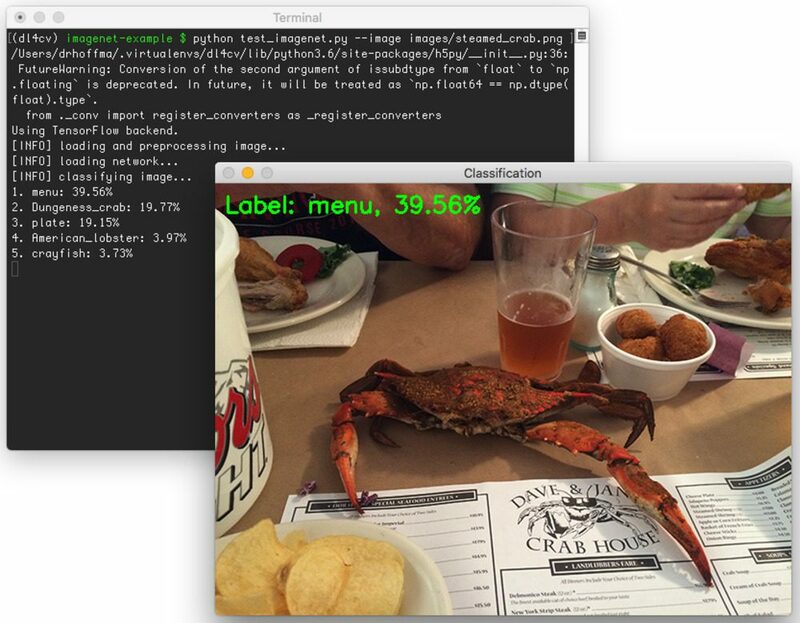 Figure 7: Image classification via Python, Keras, and CNNs. Figure 8: Recognizing image contents using a Convolutional Neural Network trained on ImageNet via Keras + Python. Figure 9: Convolutional Neural Networks and ImageNet for image classification with Python and Keras. What I find interesting about this particular example is that VGG16 classified this image as “Menu” while “Dungeness Crab” is equally as prominent in the image. Furthermore, this is actually not a Dungeness crab in the image — it’s actually a blue crab that has been steamed so it’s shell has turned red. Dungeness crabs are naturally red. A blue crab only turns red after it’s been steamed prior to eating. From start to finish (not including the downloading of the network weights files), classifying an image using VGG16 took approximately 11 seconds on my Titan X GPU. This includes the process of actually loading both the image and network from disk, performing any initializations, passing the image through the network, and obtaining the final predictions. However, once the network is actually loaded into memory, classification takes only 1.8 seconds, which goes to show you how much overhead is involved in actually loading an initializing a large Convolutional Neural Network. Furthermore, since images can be presented to the network in batches, this same time for classification will hold for multiple images. If you’re classifying images on your CPU, then you should obtain a similar classification time. This is mainly because there is substantial overhead in copying the image from memory over to the GPU. When you pass multiple images via batches, it makes the I/O overhead for using the GPU more acceptable. 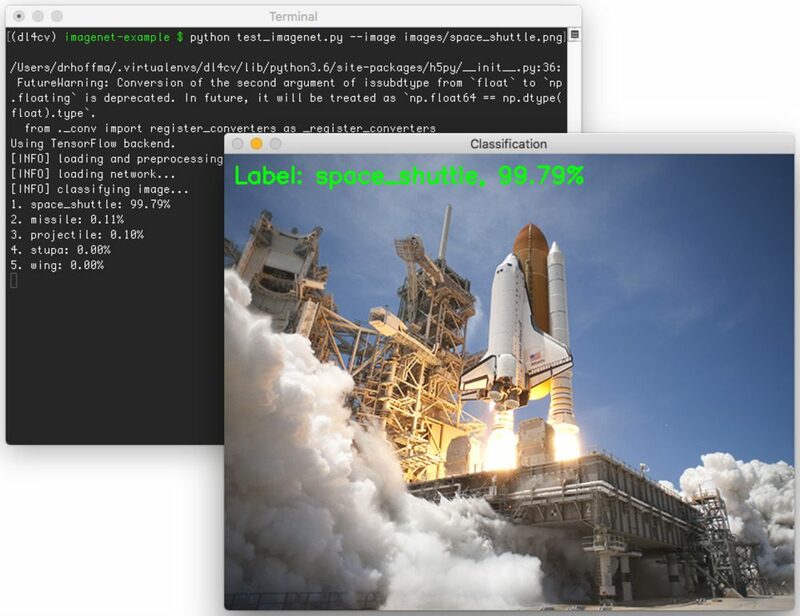 In this blog post, I demonstrated how to use the newly released deep-learning-models repository to classify image contents using state-of-the-art Convolutional Neural Networks trained on the ImageNet dataset. To accomplish this, we leveraged the Keras library, which is maintained by François Chollet — be sure to reach out to him and say thanks for maintaining such an incredible library. Without Keras, deep learning with Python wouldn’t be half as easy (or as fun). Of course, you might be wondering how to train your own Convolutional Neural Network from scratch using ImageNet. Don’t worry, we’re getting there — we just need to understand the basics of neural networks, machine learning, and deep learning first. Walk before you run, so to speak. I’ll be back next week with a tutorial on hyperparameter tuning, a key step to maximizing your model’s accuracy. To be notified when future blog posts are published on the PyImageSearch blog, be sure to enter your email address in the form below — se you next week! Absolutely. You would normally take a pre-trained network, “freeze” the lower-level layers of the network so that their weights don’t change, and then apply fine-tuning using your partial (or custom dataset). 2. how to preprocess images and keep them ready for training: should we vectorise them? where to store labels for images? 5. can we train model for two classes? These are all great questions Alexander. Training CNNs doesn’t have to be a “black art”. And honestly, I learned the answers to these via trial and error. I can’t answer all of these questions in the comments, mainly because my comment reply would be longer than the blog post it self — but I have a roadmap planned to address these types of questions related to training your own custom CNNs. Keep following the PyIMageSearch blog! do you know if there exists a similar code supporting keras over tensorflow (not only theano) ? Hello,Alexander,I’m a beginner of deep learning and meet all the same questions as you ,you point the big problem of the beginner . Have you solved these question? can you give me some idea or example code to solve these questions,think you very much! Thanks for your articles, they are well written and easy to understand. Could you write one about efficiently and quickly detecting multiple objects on an image? I already implemented a pyramid method once with Keras and a preloaded VGG16 model, but as you can imagine, it’s very slow for the exact reasons you pojnted out. Is there an architecture that would allow one to do just one pass through the net with entire image, and get bounding boxes of detected objects, along with labels? Thanks! Sure, I’ll absolutely consider a blog post on object localization using Keras. If you’re super concerned about speed, I like using the You Only Look Once method since it’s (1) fast and (2) straightforward. I’ve same problem, I want YOLO in Keras, when can we have that blog post. I’ll likely be covering YOLO inside my upcoming deep learning book. Thanks for the write-up, Adrian. I’d actually more like to use ImageNet to beg, borrow, or steal (or train my own) an unsupervised set of weights trained as an autoencoder to behave as the lower layer to help me detect edges better in a medical imaging application, where just 250 images (examples) exist all-told. Or perhaps I’d, alternatively, directly use the lower layer of this supervised-learning model. Maybe either one will work as the lower layer for generic edge detection? Not sure. But anyway if I can get a generic vision layer at the bottom from someone else’s ImageNet training efforts, then the higher layers would be trained by me on my computer hardware, to be completely application-specific. I’ve actually seen some academic papers where ImageNet proved actually helpful on medical images, even though there were no frogs and cats in the medical images, strange as this may seem. Hey Geoffrey — the lower level layers of ImageNet consist of filters that can be used to detect blobs and edge-like regions. You could essentially “freeze” these layer weights and then apply fine-tuning to the higher-level layers of the network to recognize particular structures in your images. However, depending on what you’re trying to do, I would take one of the higher level layers of the network and treat it as my feature extraction layer. Take the output of one of these layers (normally a CONV or POOL layer) and treat the output as a feature vector. This feature vector can then be used for classification, clustering, etc. I just finished this program on my platform and it runs well. Hi! I have a question to ask you. I have a image dataset. But the image size isn’t the same. How to deal with it? I want to train it.Thanks! Simply resize your images prior to passing them to the network. You can resize by ignoring the aspect ratio or resize along the smallest dimension and then taking the center crop. I’m still waiting on the official download link, so I don’t have the demo images. Please see my replies to Garret and Vineet above. Im getting a Memory Error which seems to trigger on line 40 of the code. Do you have any insight as to why this might happen? FYI, Im noty using any GPU features since Im running this on a digialocean droplet. Does that have anything to do with it? Deep Learning networks, especially Convolutional Neural Networks, require a lot of RAM. How much memory does your Digital Ocean droplet have? Hi .. It’s giving me a memory error . I m using windows7 laptop 32 bit. Cud it be due to my laptop configuration or something else.. Kindly guide … And thanks a ton in advance .. Yr tutorial is really very helpful .. If you are getting a memory error, then you likely don’t have enough RAM on your machine to load and run the network. I want to load ImageNet weights and train my 100 category images by using this weight …So can anyone suggest me how i can do this ..? This process is called “finetuning”. I’ll be doing a blog post on this concept soon. I was able to classify images successfully but how do we control the output of the classification? Like what if I want to go to the base word. 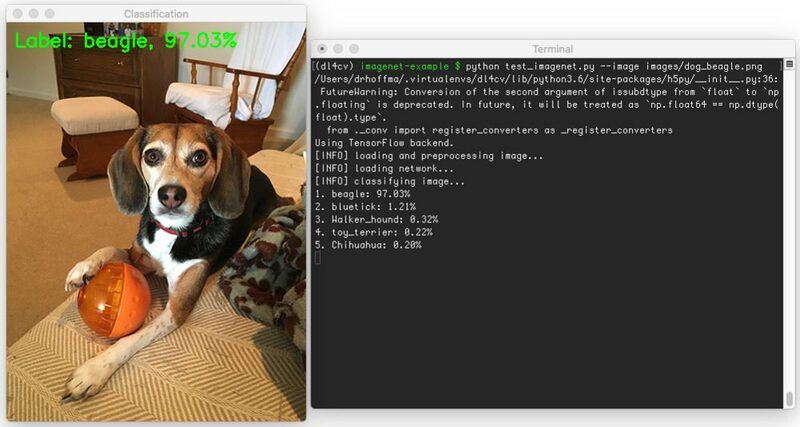 Rather than classifying “beagle” how do I tune the ImageNet to output only “dog”? Is there any reference guide for that. Also in comments you mentioned freezing lower-layers of the network to classify only part of the ImageNet. how do we do that too? Freezing the lower layers of the network and then training the upper layers is called “finetuning”. I can’t explain how to do that in a single blog post, I’ll have to create a separate tutorial for that. As for ImageNet, keep in mind that it’s built on the WordNet synsets. Therefore, you can just follow the WordNet hierarchy. Great post. 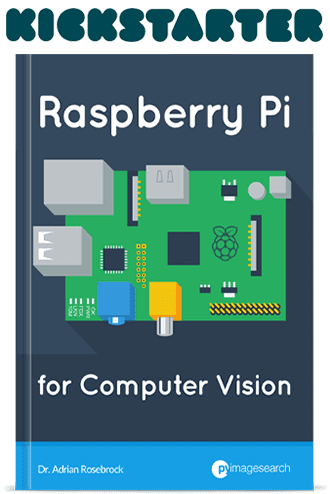 I just want to ask if this tutorial could be use with raspberry pi? Instead showing pictures taken from camera, I want to use raspberry pi and webcam to classify the image. Networks such as VGG and ResNet are too large for the Pi. You could use smaller CNNs for sure — I would highly recommend using SqueezeNet which is actually intended to run on embedded devices. If I may, I would add that you can encounter issues if your default backend is tensorflow and not theano. If you have false predictions, it can be that your code is using the wrong backend. To correct that just change the ~/.keras/keras.json to change the “tf” to “th”. Great point, thanks for sharing Wassim. If anyone else is interested in the keras.json file, here is a link to the documentation. It took me a looooooong time to try to download the pre-trained data, and python failed several times. At last I used a download tool to get all the data files and copy them to the directory. Finally I can get the system run smoothly. Thank you! Thanks for sharing Grant. I know the files are served from GitHub’s CDN which is normally very reliable. Do you have a strong internet connection? Hey great post as always! In the newest version of keras the models are loaded directly so you don’t have to clone the github repository. You can just do: from keras.applications.resnet50 import ResNet50 Pretty awesome! Also decode predictions now has a top feature that allows you to see top n predicted probabilities. Awesome, thanks for sharing this Alexandru! I didn’t realize there was now an applications module. I’ll be sure to play around with this. I’ve got a bit of a problem, I ran the tutorial at home and everything was as expected however I’ve come into uni and installed , and the images are being misclassified is the beagle is a pug and the rocket is a barrow. Not sure what to make of it… Is it a conflict with the model weights being downloaded automatically now? Nice job resolving the issue Jason! Thank you so much for the amazing tutorials. I was wondering if we could use the pre-trained models by Chollet (VGG16, VGG19, and ResNet50) for transfer learning, so that we can fine-tune the models trained on imagenet to work with another dataset? You absolutely can fine-tune these pre-trained networks. This is a topic I’ll be covering in my next book. More details to come in late-November/early-December. I can not wait for your post on Object localization. 1-results from all models are not always the same as you would notice one image classified as a desk by ResNet50 and the as a keyboard by VGG16. Different network architectures that were trained using different optimizers can certainly obtain different results on a per-image basis. What matters is on the aggregate. And yes, for this specific type of setup the classification is normally dependent on the object consuming a large portion of the image. However, with that said, we can apply localization methods to find various objects in an image. Once you have a trained neural net is it possible to use a webcam to capture video and send those images through the net for classification like with a haar classifier ? Absolutely. You likely want to “skip frames” and send only ever N-th frame to the NN. But yes, the same techniques still apply. Just access your webcam, read the frame, and pass it to your network. ValueError: CorrMM images and kernel must have the same stack size. I have not made any changes to the code apart from changing the VGG to ResNet. I’m not sure regarding that error, I have not encountered that before. I would suggest opening an issue on GitHub. I believe that’s the error I was getting when I was on Keras 1.0.7 I just updated to 1.2.2 so I could use the built-in Resnet50 model i.e. keras.applications.resnet50 and the error went away. To extract the dense feature vector of an image, the recommendation is to get it from the penultimate layer. But, what is the name of this layer for the respective pre-trained models ie. VGG16, VGG19 and InceptionV3? The keras doc has one example at https://keras.io/applications for VGG19 (‘block4_pool’) but I don’t know if this is the penultimate layer. Thanks for the help. You need to look at the source code for VGG16, VGG19, Inception, etc. Each layer in the respective architecture has a name attribute. hey Adrian, great post as always. Thanks Atti — I was just about to update the code for this change, thank you for pointing this out. This bug is still there…. Please re-read the post. I’ve put a note at the bottom regarding the updated function call. You can also refer to the latest post on pre-trained ImageNet networks with Keras. Can you please advice how to apply localization? I’ll be discussing detection/localization in my upcoming deep learning book (stay tuned). However i’m under the impression my output should be (1, 3, 250, 250)….. This is entirely dependent on your image_dim_ordering in your ~/.keras/keras.json file. A “tf” value will produce a shape of (h, w, d) while a “th” ordering will be (d, h, w). 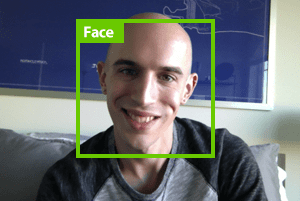 Be sure to double-check with backend you are using along with which image dimension ordering you are using. Thanks for the model, it´s very instructional. I´m manage to change between VGG16 and VGG19, but when I try to load resnet50 it´s says that there is no such model. Can you explain how to load it please. Seems like decode_predictions(preds) returns a list of five tuples for each of the classifications that has any probability at all. decode_predictions(preds) returns the tuple of the classification with largest probability. This is a tuple consisting of three variables, the id, the classification and the probability. So if I change to (inID, label, prob) = decode_predictions(preds) we can print the probability as well. Maybe this is due to some recent changes in the classification index that is downloaded? Hey Thomas — you are indeed correct. The error is due to an update to Keras. I’ll also update this blog post to reflect the change. Thank you for pointing it out! I tried to predict multiple images in a batch, but I can’t seem to get it to work. image = np.array([np.array(image_utils.load_img(fname, target_size=(224, 224))) for fname in filelist]). Or should I just do a for loop and load the images one after another ? It looks like you’re forgetting to call .img_to_array and preprocess_input on each image. You’ll also need to expand the dimensions of each image. Since that would make for a vey long list comprehension I would suggest using just a simple for loop. I would like to know the difficulty level to clasify two variants of the same concept. For example, if I already know that what is in the image is a door, to train a network to determine wether the door is open or closed. What approach would you recommend me? Is your camera fixed and non-moving? If so, this is a very easy problem to solve (and you don’t need machine learning, just basic computer vision techniques). However, if you’re looking to determine if any given door is open or closed, that is much more challenging and would certainly require a large dataset and likely deep learning techniques. You need to supply the --image command line argument as I do in the example in the blog post. Where? What does the syntax look like? Please take the time to read up on command line arguments before you continue. I have Keras version 1.2.2 installed and runs in PyCharm. Cmd line does not recognize Keras, as you have shown. If you are using a Python virtual environment make sure you have access it before running your Python script. You’ll want to make sure your command line environment matches your PyCharm environment. Someone knows this issue or have a solution? I’ve got the same error first. Then I downloaded the ready-made code (red button at the end of blog post) and ran it with success. it is interesting but if I want to classify an object that is not included in IMAGENET. Briefly, I want to recognize automatically a business card but there isn’t a class of business card. You would want to consider using transfer learning, either via feature extraction or fine-tuning. I’ll be covering both in my upcoming deep learning book. Why the program cannot be executed? When I enter “python test_imagenet.py –image images/beer.png” into cmd, it starts to do something but then “Python has stopped working” error happens… Is it because of my 4gb RAM? Thanks for the nice tutorial. Can I apply the program on my own custom data (i.e. medical images). I believe I should include “training” and “validation” data? What changes should I make to use my own custom data? You would need to either (1) train your network from scratch or (2) apply transfer learning via feature extraction or fine-tuning. 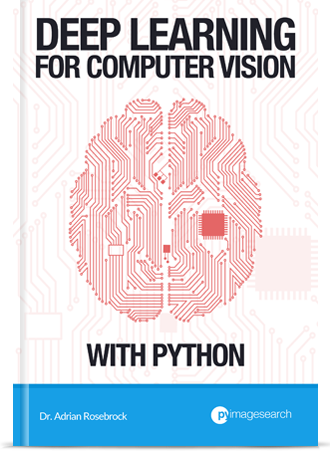 I’m covering both inside Deep Learning for Computer Vision with Python. I was trying to follow along but it seems like I don’t have imagenet_utils when I did pip install keras, anyway I can download and install Keras directly from the source so that imagenet_util is included? Thanks! 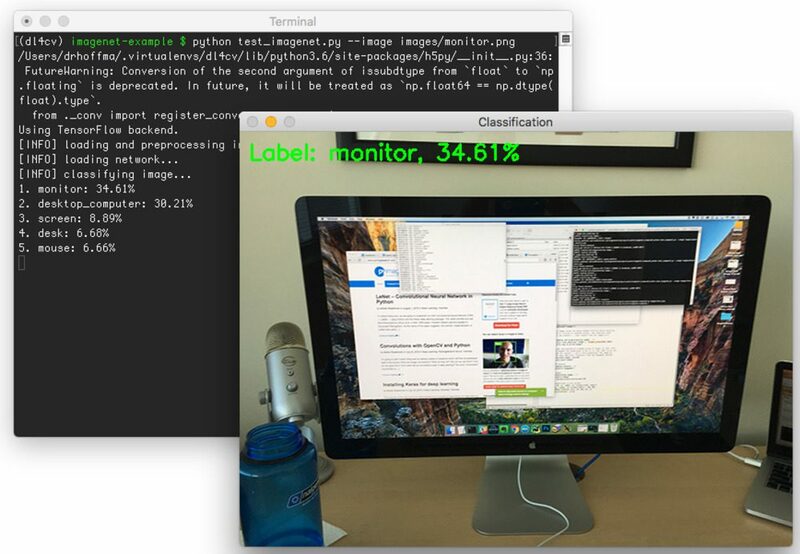 I would suggest following this updated tutorial on pre-trained ImageNet classifiers with Keras. how can i load the picture without using cv2 ? 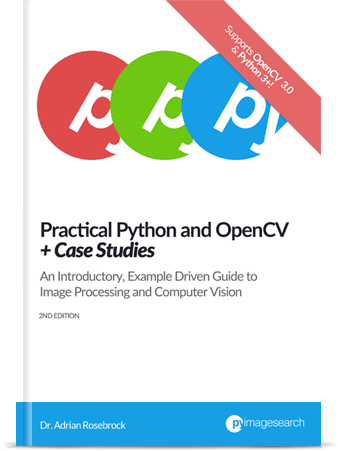 You can load an image from disk without OpenCV using SciPy, scikit-learn, or load_img provided by the Keras library. 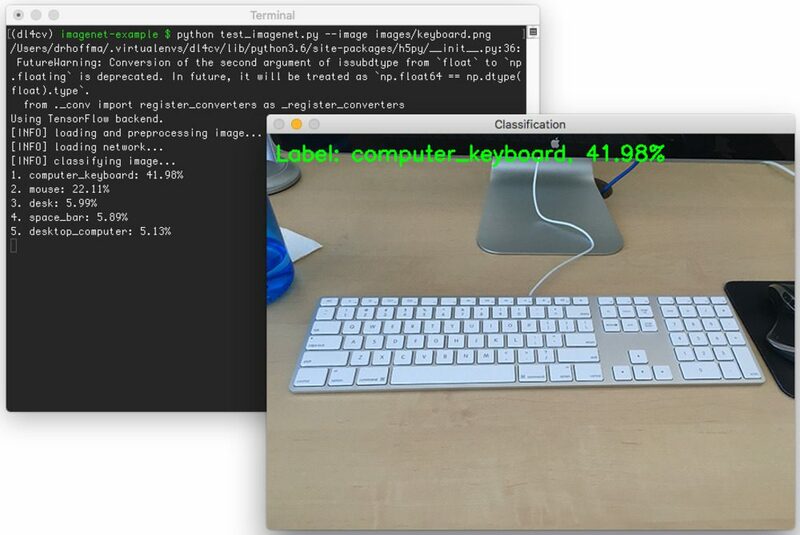 However, keep in mind that if you don’t have OpenCV installed, you won’t be able to draw the label on the image. I am getting the error “ImportError: load_weights requires h5py”.. Could you please help here? can I run this code in cmd of windows 7? Do you a guide to run this code in windows 7? Thank you! I don’t support Windows here on the PyImageSearch blog (I recommend using a Unix-based system such as Linux or macOS), but you can certainly execute a Python script via command line on Windows. I would suggest taking a look at this tutorial to get you started. 3. Download your code in this page. Please tell me if i am wrong. Thank you very much!!! You don’t have to install both TensorFlow or Theano — just pick one. From there, the rest of your steps are correct. First off, this was a very good tutorial for someone like me who is beginning to work with python. I ran it on Windows 10 using Anaconda. Just 2 things. In the most recent VGG16 architecture, a specific line has been changed (which does throw an error, and can be modified accordingly. Also, the last image (of the crab), no longer classifies it as a crab, but instead as a ‘menu’, which is also correct, since there is a (partial menu) in the photo as well. Great article! I’m just wondering if it’s possible to recognize human spine with Keras and ImageNet? I tried to find proper images on ImageNet but I couldn’t find appropriate for me. I don’t believe ImageNet has images of the human spine. You should consider gathering your own dataset. can you please provide step by step guide to train a classifier on own dataset using resnet in keras with tensorflow as backend? Hi Kay — is there a particular dataset you would like to train ResNet on? 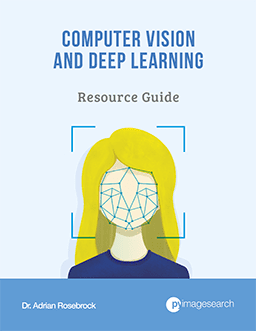 For what it’s worth, I explain how to implement ResNet and train it from scratch (with lots of explanation and code) inside Deep Learning for Computer Vision with Python. I explain ResNet + training using Keras and a TensorFlow backend as well. I would suggest you start there. I hope that helps! “ImportError: Could not import PIL.Image. The use of array_to_img requires PIL. My work is to create a surveillance camera that detect and recognize all the objects. And then it have to track the user specified objects. How i have to approach this? I’m a bit confused. Are “all objects” user specified objects? If not, are you planning on training a network to recognize the objects? Keep in mind that a network cannot recognize an object if it wasn’t trained on it. I work on a project that resembles video surveillance . It has to detect and recognize all the objects. And the user mentioned objects has to be tracked. What types of objects are you trying to detect and track? Can you be more specific? I want to detect the speed breakers in road.where can I find the classifier xml. What is a “speed breaker”? Perhaps you could provide an example image of what one looks like? it is a bump or hump in the road. This blog post covers pre-trained ImageNet models for Keras. Take a look at the Caffe Model Zoo for Caffe-specific models. My question is :- How we can extract x,y coordinates of animals from whole image.. Image classification is not sufficient for extracting the (x, y)-coordinates of an object. For that you will need object detection.